In former articles in Scribner's s Magazine I have pictured the Apache and their linguistic kin, the Navajo; the Indians of the Northern Plains; the community-dwelling Indians in stone houses, the descendants of the cliff-dwellers. 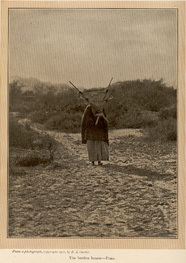 In this I will describe the tribes of Southwestern Arizona. They are in appearance, mythology and religion, as well as in life and manners, quite different. In the region spoken of we find the Yuma, Mohave, Havasupai, Walapai and Maricopa of the Yuman linguistic stock; the Pima, Papago and Kwahatika of the Piman stock. The combined population of these groups is approximated at twenty thousand, the Pima and Papago being the two largest tribes. 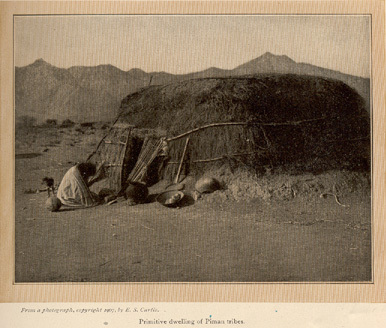 With the exception of the Walapai and one branch of the Papago they are sedentary tribes, living in fixed villages. Their home structure is of poles and brush with an outer earth covering, naturally lacking the stability of the stone homes to the North, and for this reason a study of their prehistoric life is more difficult. Compared to the Northern Plains Indians, who reverence a brave heart nest to their worship of the Great Mystery, these tribes lack bravery and the war spirit. The Pima and Papago did, however, prove rather brave in defensive warfare with marauding Apaches, who crept down on them from their mountain homes. The Yuma and Mohave were too indolent to have a brave heart, but rather preferred a life of idleness. These dwellers in the valley of the Colorado are physically a magnificent group of people. Previous to the introduction of the white man's diseases, there was probably nothing comparable to them as physical types in the United States. Their lazy life, low altitude, with its excessively hot climate, seemed to develop their physique, but the same conditions which made giants in stature seemed to require no mental activity or development. Their mythology is apparently an incipient one, and, compared to that of the Pueblos, is so crude that it would seem to be of a people uncountable ages closer to the beginning of man. This probably is not the case, however, but merely indicates a lack of mental activity. The ease with which they gained food undoubtedly tended to retard their mental growth. The valley had its great annual overflow. Following this, the vegetation, wild and planted, sprang up and grew as those unacquainted with such localities cannot realize. The river had countless quantities of fish to be caught in rude traps with little effort. Rats, rabbits and small game were abundant and close at hand. The swift-footed deer of the hills they did not molest, as that would require effort. The greatest display of natural intelligence seen among them is their tribal custom of cremation. This, according to their legends, was taught them by their creator, Matevilye, and they follow his instructions with true Indian tenacity. One of my Yuma interpreters of the past season came to me with considerable anxiety: "Missioner wants me to come to church. I go to church, when I die they put me in the ground to rot. I no like that. Burned up the way Matevilye say, just ashes. That all right. What you think?" I must confess, as one rather favoring his way, to not being able to see why the old chap should be punished for going to church by being buried against his will. It is likely that an ethnologist would make a poor missionary. However, the missionary has something of an argument for his desire to change their way of disposing of the body, as it is certain that we see in the Indian cremation much that is not a part of the modern method, as it is here that he pays the greatest attention to the teachings of the Yuman creeds as taught them by the Creator. At their approach of death, relatives, friends and neighbors gather about waiting for the soul to take its flight to the sand-hills of the after-world: a land of plenty, where when one melon is picked another comes; "no one sees it come; you just pick it, another one there." The body is prepared at once after death and carried out in blankets to the place of cremation which has in the meanwhile been prepared. A shallow hole has been dug in the earth and the fuel piled high on this. The body is placed on the top of the fuel, after which fire is applied at the four cardinal points. During the time of the burning the multitude stand about and wail in the most melancholy fashion, continuing until fuel and body are but a mass of embers and ashes. These are raked into a pit and covered with earth. And so are the last rites to the departed among the tribes of the Yuman stock. 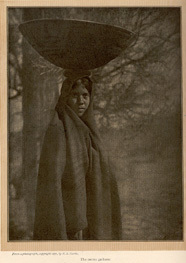 The Havasupai, who have their home in Cataract Canon, a branch of the Grand Canon of the Colorado, have the most unique home-land of any tribe of our Indians. It is but a tiny garden spot in this vast chaotic wilderness. To reach the home of the Havasupai one must first make the trip across the plateau to the rim of the canon, no small part, and then he who would enter must take his choice of two trails; either one will try the courage of all but the experienced traveller of canon trails. Once there, you feel well repaid for your effort. If the season is midsummer, while every rock wall and crag is reflecting the sun's heat, the upper regions are a veritable Hades, and this garden spot, with its cool shadows and bubbling streams, an oasis in it. On my first journey here the upper world at the canon's rim was wrapped in a blinding snow-storm which chilled one's very life. As our pack animals picked their way down the trail and entered this canon home the peach trees were in bloom, birds were singing, all in the joy of life and spring. I could but think, "This is paradise." Theirs is a world of but a few hundred acres walled in first by sheer red stone walls 400 feet high, and beyond those perpendicular walls are broken, crumbling piles of rock of many colors, reaching on and on, but ever up, until one comes out on the pinon-clad plateau. These canon dwellers have always been a small group. Disease and change in manner of life have dwindled their ranks until there is now but a few more than a hundred, and it is a safe prophecy that ten years from now there will be no more than half of that. They are an agricultural people, and have been from prehistoric times. They insist God gave them the seeds of the corn and vegetables, and the peach-tree, but admit that man brought the fig. Their water-supply is from a beautiful spring which has its source in the upper end of their home spot. Here it springs from the canon's floor, a beautiful, transparent stream, flowing along with willow-bordered banks, then, as a cataract, leaps high over a sheer cliff and forms in dark pools below. The water of the stream is used for irrigation; they throw out ditches and guide them close along the outer margin of the field. 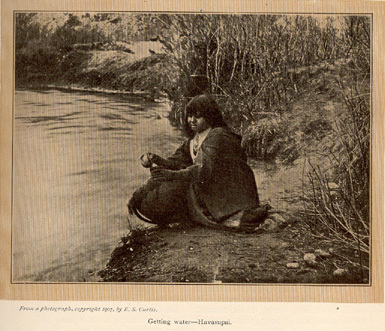 They call this "making water run uphill," and claim it was taught them by Lee, who, after the Mountain Meadow massacre, took refuge with these people for a time. In the spring they gather and cook great quantities of the mescal, cooking it in large pits like other tribes of the region. These pits can be seen all through Grand Canon and its many branches. Many of them undoubtedly have been used from pre-Columbian times. In the winter season the Havasupai went out on the plains above in their annual hunt for deer, at once changing from vegetarians to meat-eating people, fairly gorging themselves on the flesh of the deer. All this is changed. The deer are scarce, and permission to hunt now rarely and grudgingly given by their Father in Washington. 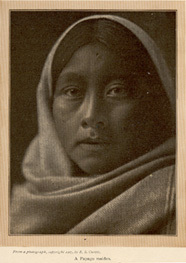 The Maricopa long ago seceded from the parent Yuman group in the valley of the Colorado, and slowly worked their way up the Gila valley until they reached the land of the Pima. Here they became neighbors of the Pima and affiliated with them, particularly in war of defence against the wandering tribes. When or why the secession from the original group is buried in the confusion of Indian traditions. However, that the wandering began but a few generations ago is quite certain, as the type still retains traces of the Yuman. 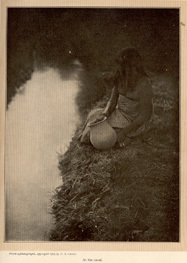 In life and manners they have become as Pima, but in language, religion and mythology they show but little change by reason of the tribal separation and contact with an alien culture; this seems to be a good argument that it is here we should anticipate the least change in studying any primitive people. Looking on the map, the smallness, as indicated, of the Pima Reservation would lead one to presume that they were a small tribe. Far from it! They are a large and strong tribe, mentally one of the keenest in our land. The Pima claim to have lived always in the Gila valley, their lands stretching along some sixty miles of its length. They farm by irrigation and likely had canals larger and longer than other tribes. The very large prehistoric canals which formed a part of the development, with the building and occupancy of the Casa Grande and other like large prehistoric ruins, are in the country of the Pima. In their legends they account for these ruins and ditches and claim them as the work of Pima. There is, however, little to encourage this claim. The ruins of the region show structures of massive walls, many rooms and several stories in height, while the Pima home structure, when first observed, was, as it is now, a single-room affair, round in shape, built of poles, covered with earth. Their traditions of the former occupancy of these many-roomed communal structures is probably but an attempt to fit their tradition to the fact of the old ruins. One of the most picturesque features of the Pima home country is the giant cactus, Sahuaro. This strikingly grotesque plant is of much importance in their life. Great quantities of its fruit are gathered; they use it fresh, dried, make it into a thick, heavy jelly; and, lastly, but by no means least, is the making of it into wine. They, like the Maricopa and Papago, are expert basket-makers and potters. Their large ollas are the universal water container, while ollas of small size and more graceful lines are used as head-jars in carrying water from the supply to the home. The principal kitchen-utensils are pottery-ware of their own making. One can, without too far stretching of fact, say that the Pima are well advanced in the ways of civilization, much of which is due to one man--the sort of man that is born, not made. It is Dr. Cook, the Pima missionary. No doubt the advance has seemed to him heart-breakingly slow, and there have been many days when he could but wonder, "What is the worth of it all?" Still, his thirty years of patient, faithful work have brought a real uplifting of the tribe, a showing that few men can make for their life effort. 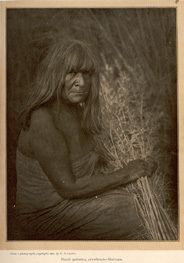 The Papago, close kin to the Pima, can well be divided into two groups, the sedentary and the wandering. The community-living, home-loving group can scarcely be driven from their homes, while those of the gypsy-like bands cannot be kept in any one place. Good authorities, like Dr. Cook, insist they wander from mere necessity of gaining a livelihood. These wandering Papago, numbering several thousand, are scattered about the whole of South-western Arizona from the juncture of the Gila and Salt Rivers to and into Old Mexico. Some villages of a few families will be dwelling far down in the mountains to the border of Old Mexico, and probably have small herds of scrubby cattle, and, as well as the cattle, patches of wheat which are grown from freshet water, flowing down out of the hills. Their wheat harvest is very early in the spring, and when it is closed they trek off to the north to take part in the Pima harvest. The harvest season is always hot, so the wily Pima prefers to hire the wandering Papago to do the work while he dozes in the shade. 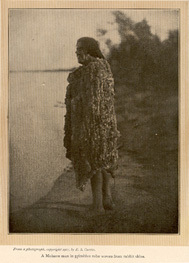 The Papago's pay is a portion of the wheat, which he loads onto his ponies and takes back to his winter's home in the mountains of the south. To add to this store the Papago takes advantage of the proverbial Indian hospitality and desire to make gifts, and gives a Papago dance for the entertainment of the Pima. The Pima, to show their appreciation, give them much grain. 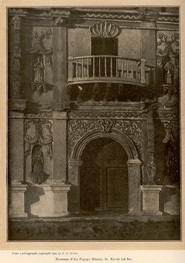 The sedentary Papago's home is in the valley of the Santa Cruz, about the mission of San Xavier, one of the finest ever built in North America, and without doubt the finest still standing in the United States. 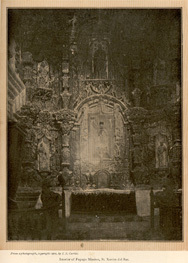 The wonderful old church is on a slightly raised plain, overlooking the valley of the Santa Cruz, and about it are grouped the homes of the Papago. Their home structure has, in a great part, changed from the old-time round houses, and has become the rectangular one, half Papago, half Mexican. Below their village lie the well-kept farms, small in size, yet ample, as the Indian's wants are few. A few days' journey to the south of these people are the Kwahatika villages, so little known that the name scarcely appears in print. Broadly, they are like their linguistic kindred of the Piman group, from which they probably separated within the last few hundred years. In religion and mythology they are still the same. They are, in fact, like a degenerate outcast from the family; in appearance the same, but not of the good blood. They can truly be termed "desert Indians." Their five villages are scattered about in the desert, and he who did not know the way of the land could well wonder how even the hardiest of human beings could contrive to live here. The secret of their existence is that they were past masters in dry farming before Colorado was named. Each village is located where it receives the natural drain of a vast area. The Kwahatika will prepare his small farm, and if there is not a natural rise of ground about it, will enclose it in an earth embankment. When the severe winter rains come on the freshet water flows down the valley and they catch this and guide it out on the prepared land, using the collected water of tens of thousands of acres to thoroughly soak their five or ten. With a rain or two of this sort they are certain of a fair crop. 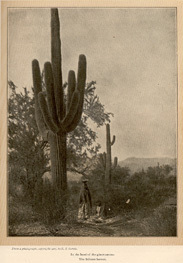 The low foot-hills of the region abound in the giant cactus, furnishing fruit in endless quantities, the only limit of the supply being their ability to gather it in the few weeks of the harvest. Six months after the harvest season one can see huts still containing wagonloads of the earthen jars filled with the thick jelly, each jar carefully sealed with clay. 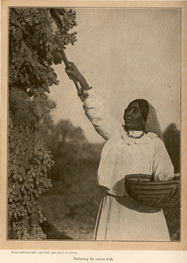 The mesquite pod, which forms such a large part of the natural food of this region, does not abound in the land of the Kwahatika, but the mesquite forests are not so far away but what they can journey to them in harvest time.